For payment information, please contact the school office. The school year has 200 days of educational instruction and runs from the beginning of August to mid-June. Payments begin in July and end in May. FACTS payments can be made in one full payment on July 20th, in two payments (July 20th and January 20th), or monthly on the either the 5th or the 20th of each month (July-May). These fees are non-refundable*. Registration covers: placement, insurance, textbooks, technology, enrichment resources, and informational material. Each family is required to complete 50 service hours. Click here for ways to fulfill your hours. All hours must be completed by May 31st each year. Failure to pay by this deadline will result in a charge of $10 per incomplete service hour. 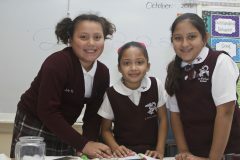 Fundraising obligations begin at $400 per family–plus an additional $50 per student for classroom activities. Our fundraisers include 2 raffles and chocolate sales. Please understand that every family must participate in all of our fundraisers. If you do not participate, the fundraising fees and an additional late fee will be added to your monthly FACTS payments. We also raise funds for other charities throughout the year.